The 1225.80 ‘buy trigger’ I’d suggested here yesterday went unachieved, sparing us the false encouragement of a bull trap rally that died in the wee hours Monday morning. The subsequent dive exceeded a Hidden Pivot support at 1199.60 (see inset), promising more pain for bulls down to as low as 1176.30 over the near term. The futures were ostensibly a bull trade shortly after midnight Tuesday, but let’s wait for a print at 1225.30, lest we court disappointment. Take a free trial subscription that will allow you to access not only the touts, bulletins, updates and impromptu trading webinars during market hours, but a 24/7 chat room that draws veteran traders from around the world. à propos de ces "bonnes statistiques de l'emploi", le décryptage de Dave : une belle fraude ! se rendrait t'on enfin compte du double langage et de l'arnaque de toute cette rhétorique? cette séance ( non cloturée ) étant toutefois TRES encourageante ! Oui Marie, et maintenant juste apres la cloture, le USD se prend une grosse claque ! Ca entraine pour l'instant le gold et le silver dans le sillage. 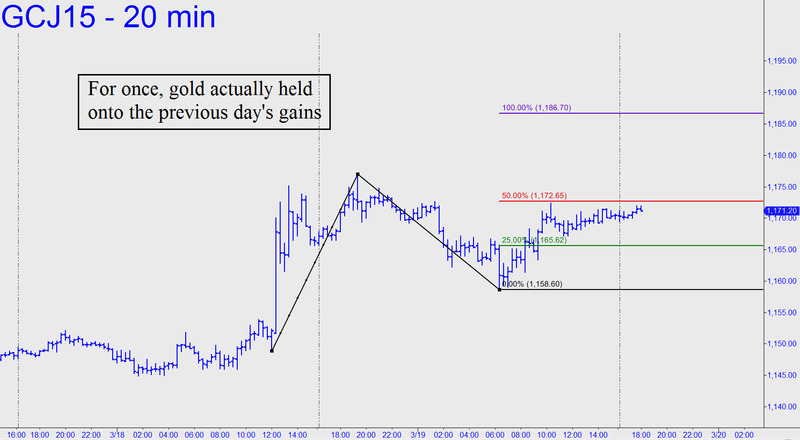 For once in a rare change, gold futures have actually held onto a gain achieved the previous day. Although they made no upside headway on Thursday, it was something of an achievement for them to have merely stayed aloft. The bullish abc pattern shown has a clear-as-can-be rally target at 1186.70 that has been confirmed by the stall precisely at 1172.70, the ‘p’ midpoint pivot. As always, an easy move through p would imply more upside to D, at least. 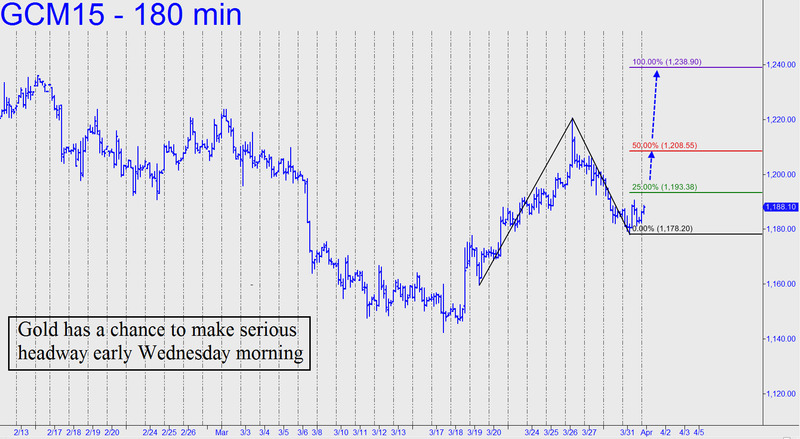 If bulls are revved up and ready to blast off, they should be able to surpass 1186.70 today without much trouble. Take a free trial subscription that will allow you to access not only the touts, bulletins, updates and impromptu trading webinars during market hours, but a 24/7 chat room that draws veteran traders from around the world. Alasdair Macleod sur le dernier FMOC, rejoint mes analyses sur la duperie qu'entretient la FED sur une prochaine hausse des taux : le marché va bien finir par s'en appercevoir, et c'est peut être bien en ce moment que ça se passe ... On le saura bientôt ! Ben kess kiss pass ? après une séance volatile ( voir post précédent ) l'or et l'argent cloturent en faible hausse, et le hui en baisse. 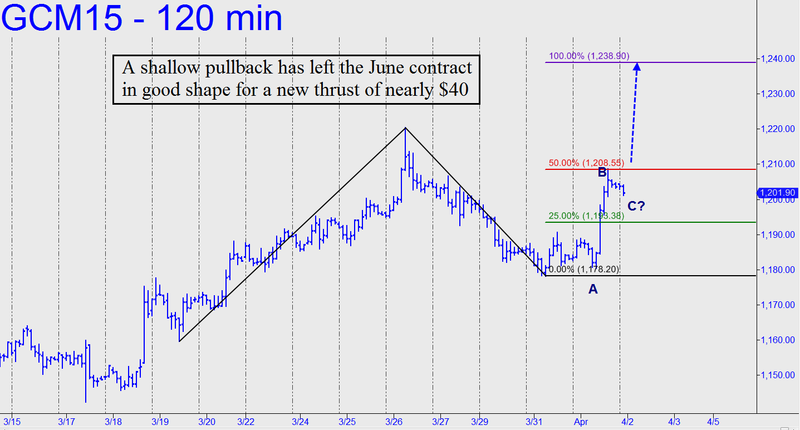 June Gold’s chart leaves a little more room for corrective weakness than did the March futures’ chart. Specifically, the selloff of the last three days has yet to breach the 1180.70 Hidden Pivot support of the patterns shown. If that were to occur, we would have to infer that more downside to at least 1173.30 awaits. That target is calculated by simply sliding up to the commanding high at 1220.40 as a point ‘A’ for the downtrending pattern. Traders should be aware that the 1190.90 midpoint pivot of the first pattern could have been shorted ‘mechanically’ at around 6 a.m. EDT Monday to produce an eventual profit of about $1000 per contract. For your further information, a mechanical short from the 1187.20 midpoint pivot of the larger pattern is already ‘live’. Take a free trial subscription that will allow you to access not only the touts, bulletins, updates and impromptu trading webinars during market hours, but a 24/7 chat room that draws veteran traders from around the world. Although gold has gone reliably opposite stocks lately, it is getting precious little lift so far Tuesday night despite the fact that index futures are under heavy selling. In any event, it’ll take another $5 of upside to trip a bull signal for the pattern shown. 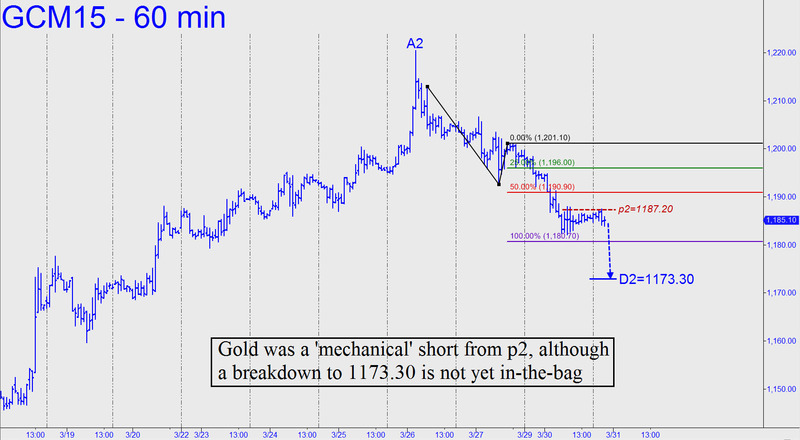 It projects to 1208.60, the midpoint pivot, or to 1238.90 if any higher. This would be quite bullish, since it would not only exceed last Thursday’s bull-trap spike, it would also generate a powerful new impulse leg by taking out March’s high, an external peak at 1223.60 that was recorded exactly a month ago. Take a free trial subscription that will allow you to access not only the touts, bulletins, updates and impromptu trading webinars during market hours, but a 24/7 chat room that draws veteran traders from around the world. Yesterday’s strong rally, amounting to $26 from low to high, topped within a single tick of the 1208.60 target I’d provided. This validates the pattern itself (see inset), with the implication that any upthrust exceeding the high would be a good bet to reach 1238.90 precisely. That is the Hidden Pivot ‘sibling’ of yesterday’s target, and odds are good that it will be reached. I say this because the rally itself refreshed the bullish impulsiveness of the intraday charts when it exceeded some ‘external’ peaks from last week. The pullback thus far has been shallow, but traders should use the small ABC pattern at the rightmost edge of the chart to generate an entry signal. To limit risk, the actual trade should be done on chart of 3-minute degree or less once it has been tripped on the larger charts. Take a free trial subscription that will allow you to access not only the touts, bulletins, updates and impromptu trading webinars during market hours, but a 24/7 chat room that draws veteran traders from around the world. L'économie des Etats-Unis a créé beaucoup moins d'emplois qu'attendu en mars tandis que le taux de chômage est resté stable, selon les chiffres publiés vendredi par le ministère du Travail. L'activité économique n'a généré que 126.000 emplois en mars, soit une chute de 52% par rapport à février dont le chiffre a en outre été révisé à la baisse. L'estimation médiane des analystes tablait sur 250.000 nouvelles embauches. Le taux de chômage est resté stable à 5,5% comme s'y attendaient les analystes. Price action near a midpoint Hidden Pivot resistance at 17.240 should tell us all we need to know. If the futures push easily past it, expect the rally to continue over the near term to at least 18.045. The Hidden Pivot also has the potential to set up a low-risk ‘camouflage’ entry opportunity for bulls who missed getting aboard Sunday night’s gap-up opening. Specifically, if the futures pull back in B-C fashion after exceeding 17.240 by a tick or two, you should zoom down to the 5-minute chart to look for an uptrending ABC entry pattern. The AB segment would be legitimately impulsive, since it will have surpassed the external peak at 17.195 recorded March 27 on the way down. ______ UPDATE (11:28 p.m.): Buyers probed and diddled the 17.240 pivot for nearly seven hours yesterday before taking a running start at it. This they did, however, at a time of day when durable rallies almost never happen, and this one was no exception. Buyers will need to regroup for another try, presumably within the bullish framework of the pattern shown. There’s no point ‘C’ low here yet, but if and when one is generated, use the midpoint resistance of the resulting pattern to gauge the strength of any rally. Take a free trial subscription that will allow you to access not only the touts, bulletins, updates and impromptu trading webinars during market hours, but a 24/7 chat room that draws veteran traders from around the world.